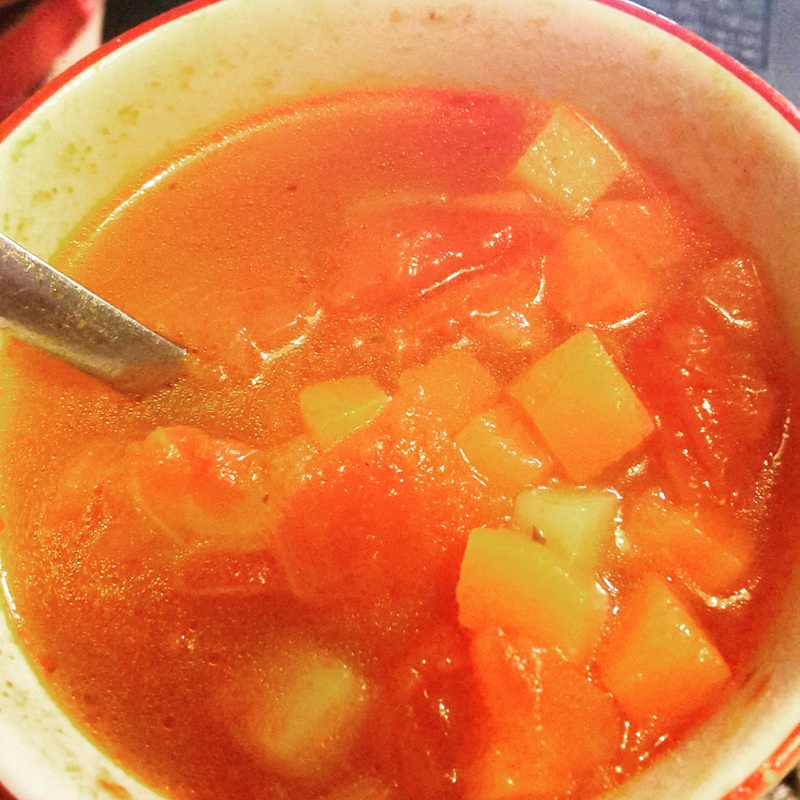 When I was younger and home sick from school, my mom would always make me a bowl of Campbell’s vegetable soup with ABC pasta (I liked vegetable soup better than chicken noodle). When I became a vegetarian, I stopped eating it because it had meat based (beef or chicken) stock in it. And then I moved to the UK and stopped being vegetarian, but Campbell soup wasn’t sold here until recently. Two weeks ago when I was sick I happened to be looking at the tinned vegetables in Tesco and I spotted a tin of mixed veg – carrot, potato, parsnip, and peas. I thought it might be nice as a soup, so I picked some up and I’ve been making this soup every few days since. It’s quick, cheap, easy, and surprisingly tastes just like Campbell’s, so it’s also a nice bit of comfort food for this expat. 1. Check the cooking time on the barley, pasta, or rice as this will determine how long the soup will take. Pearl barley takes about 30 minutes, but small pasta only 10-15 minutes. 2. Combine everything in a large pot, bring to a boil, and then simmer per directions on the barley, pasta, or rice (I simmer mine for 30 minutes). And you’re done. This made plenty for my husband and I to have for lunch over two days. I think the total cost for this is under Â£1, so it’s quite frugal too! *Double check to make sure your stock is still syn free, or calculate the syns. Oxo cubes are free. Please note: Syn values are based on my exact ingredients using the online calculator. Your Syn value may vary based on your ingredients and the size of your baking containers and portions, so use this number as a guide only. Syn values also frequently change, but these values are correct at the time of publication. Hey do you not have to add water to the soups? You don’t need to add additional water because you have added stock/broth. Although I will say you might need to add extra water when you reheat the soup because if you’ve added pearl barley or pasta, they will continue to absorb water. Ohhh I see, because it didn’t state I just crushed a stock cube into the soup! I did however keep adding water though, turned out rather nicely, added some peppers and lightly fried some onions w garlic to begin. Nice little lunch that, thanks! Sorry for the confusion. I thought ‘1L vegetable stock or broth (made from scratch, cubes, or stock pots)’ was enough indication to add water. Though there actually is quite a bit of liquid in the tins of veg, so it could probably be done and would make a thicker soup. Glad you enjoyed it, though no onions or garlic are ever in any of my recipes or in my kitchen as I am allergic to both, but I’m sure they made a tasty addition!